Start the day right with the most important meal and delicious servings of Garlic-Smoky Longganisa! Follow this recipe to learn how to cook your own from ingredients right in your kitchen. It's definitely a good morning with yummy eats! 1. In a bowl, mix ground meat, salt, vinegar, paprika, garlic and pepper. Combine well. 2. Cover bowl with a plastic wrap or transfer into a container with a cover. Let it marinate in the fridge overnight. 3. Tie or close the end of the sausage casing. Insert the nozzle of a funnel to the open end of the casing. Scoop the meat mixture into the funnel and gently pack into the casing. 4. Once filled, tie a knot to enclose. 5. To create some space or links, twine around 2 to 3 inches interval. 6. Once in the casing, longganisa mix may be put in the fridge for a day to dry before freezing. It may also be stored in the chiller for days or in the fridge. 7. 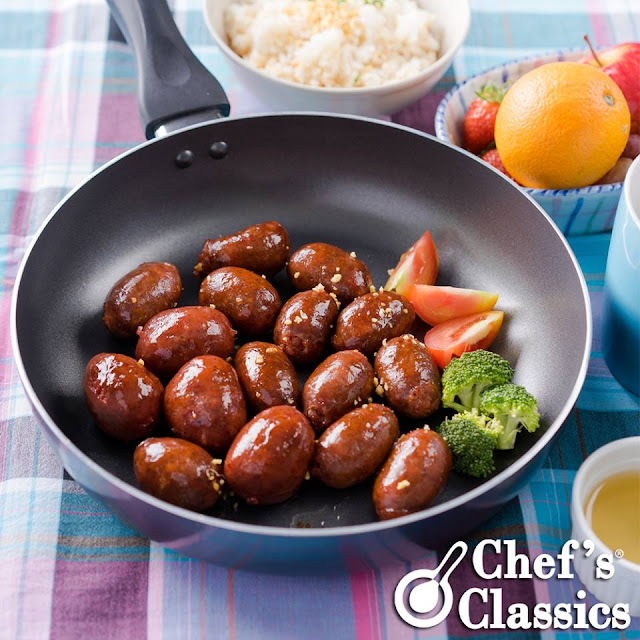 Heat Chef's Classics Daisy Frypan and bring to boil water. Add in longganisa, simmer for 20 minutes using low heat. 8. Using the same pan, discard water and add 3 tbsps of cooking oil to fry the longganisa. Cook until golden brown. 9. Best served with sunny-side up egg and fried rice. Enjoy!